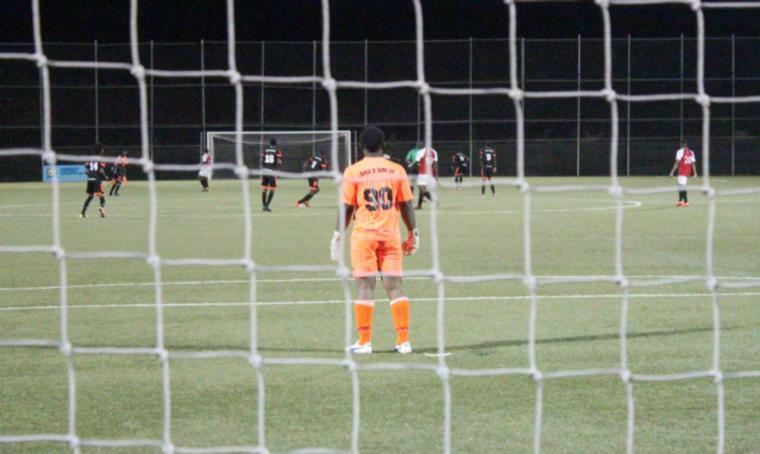 Silver Sands goalkeeper Gabriel Layne watches as his team takes on Central League Spartans this week at the Wildey Turf. 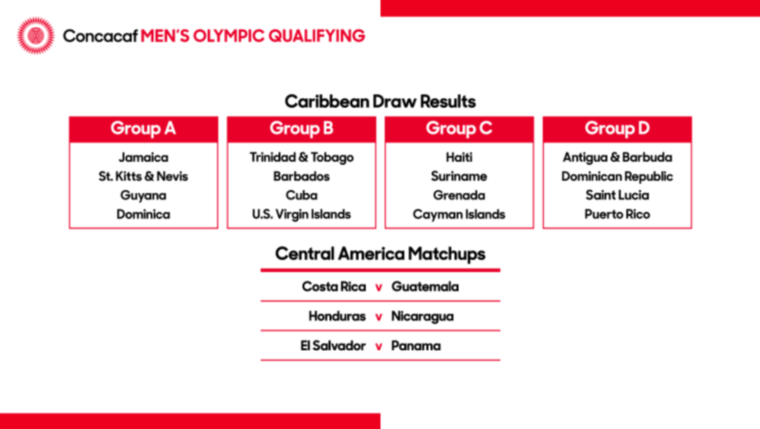 With all eyes on the movements in the Barbados Premier League, special attention must be paid as clubs put in their bids for promotion from the Barbados Football Association's Division 1. With exciting battles raging on weekly, the latest action saw several teams racking up points as their campaigns continued over the past few days. This past Monday, Blackspurs got things started with 2-1 win that sees them to third place in Zone 2. Coming up against Whitehall Titans at the Wildey Turf, the Spurs had to come from behind to take the victory. Rashad Phillips opened for the Titans in the 4th minute, but shots from Rondelle Vaughan (20th) and Malcolm Stewart (41st) found their mark and gave Blackspurs the go ahead. 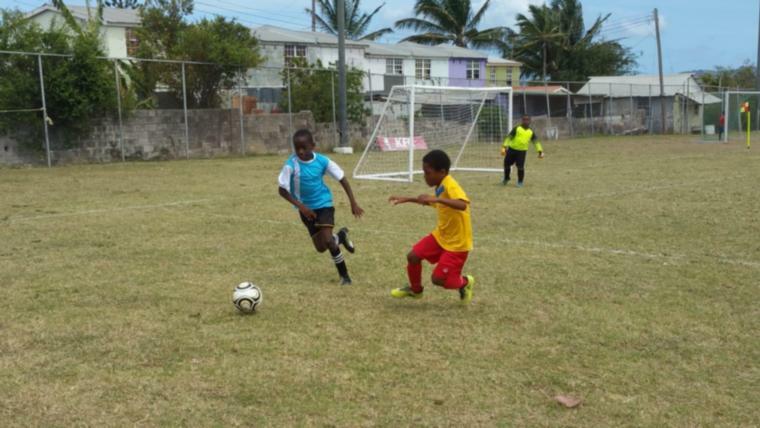 Monday's other game saw Bagatelle handing down a 3-0 drubbing to Ivy Rovers. Marlon Headley and Shomari Stevenson gave the St. Thomas team a two-goal cushion after beating the Ivy keeper in the 15th and 26th minutes. Adrian Hall added the third in the 86th. On Wednesday, Silver Sands added some credit to their bid to gain promotion back into the top tier after edging out Central League Spartans at the Turf. 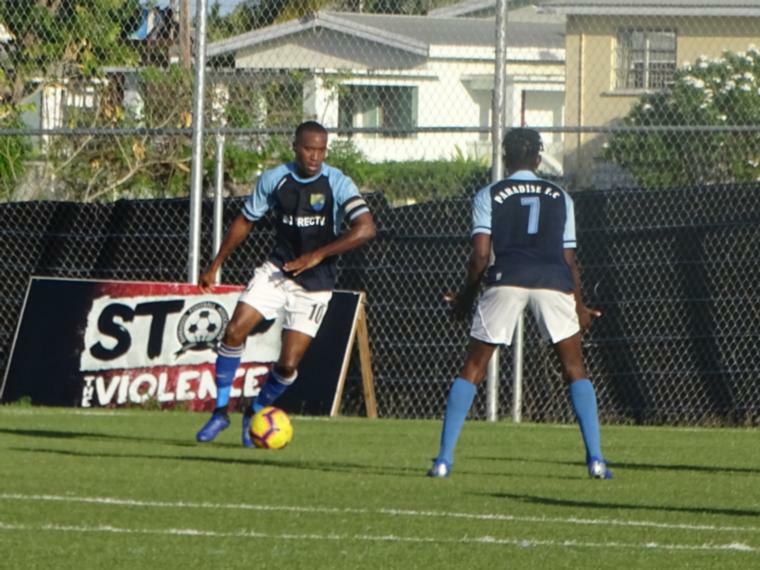 Mario Birkett opened for Silver Sands in the 4th minute and the Christ Church team stayed up for the remainder of the first half. A goal in the 73rd minute from Mickele Culzac saw the Spartans back on equal terms, but Silver Sands tipped the scales again in the 85th with the game-winner. Wednesday's nightcap saw Zone 2 leaders, Wotton coming from two goals down to dispatch Whitehall Titans after Khaleed Bryant (38th) and Jason Blackman (51st) put the St. Peter side in good stead. With Wotton beginning to fight their way back just two minutes later with a goal from Kahlil Gill (53rd), the expulsion of Shakeil Clarke in the 85th minute would not help the cause of the Titans. Wotton made the most of the advantage and Baggio Alleyne and Zavier Parris scored twice for the 3-2 win in the 88th and 90th respectively. 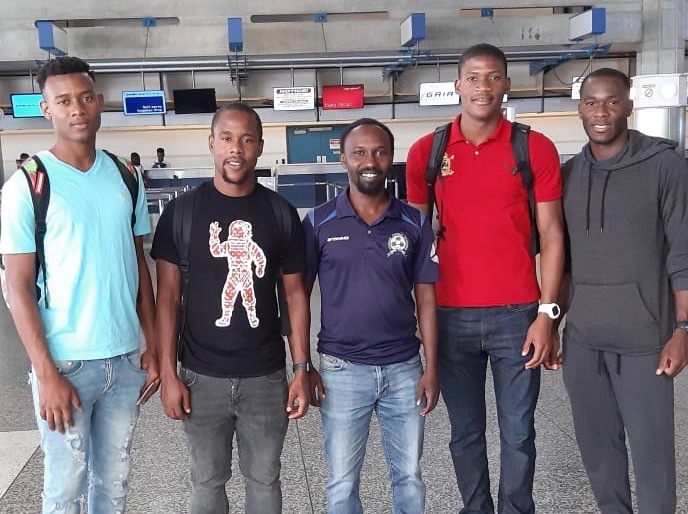 Last night, Haynesville and the Barbados Defence Force parted ways as equals as action continued at the Wildey venue. The soldiers struck first in the 3rdminute through Jelani Bruce, but Haldain Spencer had a reply in the 10th. Haynesville then took the lead in the 21s tminute when Aqiyl Cumberbatch rocked the nets. He would go on to score back-to-back goals and completed a brace in the 39th. The soldiers would pull one back before the half broke as Nicholas Best beat the keeper in the 44th. Perseverance paid dividends for the Defence Force and they would find the equaliserat the 11th hour. 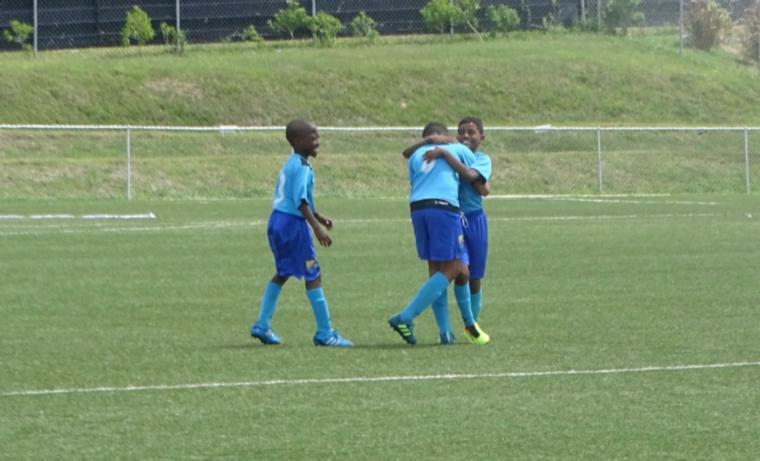 In the 90th minute, Shane Codrington would deliver the goods to see the teams leaving with a point each. The last game at the Turf on the night saw Deacons taking a clean three goals from Pride of Gall Hill – a side that has seen better days. Neither team would find the nets for the entire first half but that all changed in the second when Deacons knocked home all three within 30 minutes. Stafon Ifill (57th), Shaquon Haynes (77th) and Ridon Pilgrim-Ramsay (86th) were the ones to get the ball over the line. The league continues with two fixtures this evening at the Wildey Turf. Central League Spartans have a half to finish against Wotton at 7:00 PM while Ivy Rovers take on Potential Ballers at 8:00 PM.